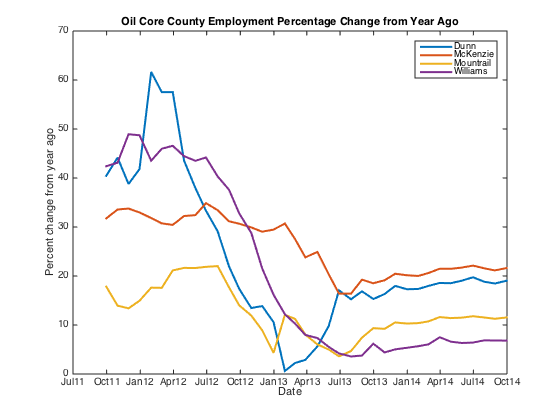 So yesterday I looked at how the oil patch core counties (Dunn, McKenzie, Mountrail, Williams) are responsible for over 50% of the employment increase in North Dakota in the last year (posting). I thought I would look at those particular counties again and compare to the state overall. I looked at the percentage change of employment from year ago levels. This should remove a majority of the seasonal effects in the data though we can never be sure. For September the state was up 2.88% from year ago levels. Williams county was up 6.82% from a year ago, Mountrail county was up 11.54%, Mckenzie county was up 21.62% and Dunn county was up 19.04%. For comparison, the percentage changes for Burleigh, Cass, and Grand Forks counties over the same time period were 1.44%, 1.14%, and -0.99%, respectively. For McKenzie county the average percentage change from a year ago level over the last 12 months was above 20%. Now I talked about labor force changes in the micropolitan areas like Williston in the past. Employment in the four counties tell much the same story. Honestly some of the numbers just seem ludicrous. When Mckenzie has around 30% increases over year ago levels for more than a year, or when percentage changes seem to settle around 20% what do you do? Well actually the first thing you do is check your math. When you find out that you did the math correctly you shake your head and say this is a positive economic shock that quickly exhausts the capabilities of the local economy to fully absorb. The one benefit is the persistence of this shock. The ongoing nature of oil production activities means the local area has had time to catch up and adjust, at least in a partial capacity, as further growth shocks occurred. When I go to conferences people often ask me if the situation in North Dakota is actually as dramatic as the typical stories in the news media. I usually tell them the numbers are even more dramatic. This graph is just another in a line of numbers that are amazing.